Just Smooth Taming Shampoo - 300ml - $18.95 - as gentle as water, it instantly creates manageability and frizz control and contains a unique FadeStopFormula to minimize colour fading with every use. Just Smooth Taming Conditioner - 300ml - $18.95 - instantly detangles and nourishes for smooth and touchably soft hair. Just Smooth Smoothing Blow Dry Spray - 200ml - $18.95 - speeds up drying time and improves manageability for smooth responsive styling while shaping the hair and giving it light hold. 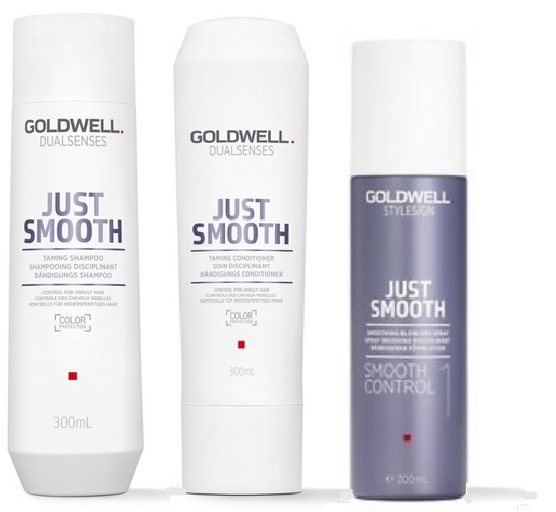 Available now wherever Goldwell products are sold - check out www.goldwell-northamerica.com to find a salon near you.